Tools should be cleaned regularly throughout the year, but many of us are so busy we forget to clean them. 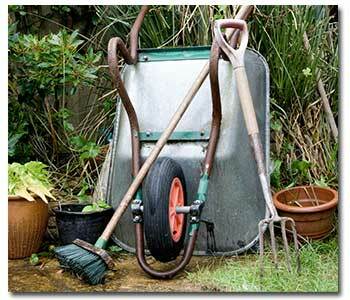 Cleaning is not the most enjoyable part of gardening, but it is essential to maintaining your tools and plant health. There are many benefits to cleaning and sharpening your tools. Maintaining your tools will help them last many more years. You’ll save money and conserve resources. Sharp tools help prevent disease. The blades of mowers, pruners, and shovels often cut through plant leaves, twigs, and roots. Dull tools tear or rip the plants, leaving ragged wounds. We know from our own personal experiences that rips and tears are easier to infect and take longer to heal than clean cuts. Sharp tools are more effective and efficient. They are easier to cut with making your job less strenuous and more enjoyable. Disinfectant such as chlorine bleach, or Lysol. Chlorine bleach is an oxidizer, make sure to rinse off thoroughly, dry and apply oil so that your tools don’t rust. Dull and dirty shovels, trowels, pruners, mower blades, spades, shears, and loppers. Clean all dirt and grime off the blades and handles. Disinfect your tools using chlorine bleach or Lysol. Use either full-strength or 1-to-5 solution of chlorine bleach or Lysol. Rub the solution on the blade or let the blade soak in solution for 1 minute. Immediately rinse off solution so that no chlorine bleach or Lysol is left on the blade. Dry thoroughly. If you are only disinfecting your tool apply oil now. If you are moving on to steps 3 and 4, wait to oil until you have sharpened your tool. Hold the file firmly against the beveled edge and, starting at the handle, push the file away from you as you move it down the dull edge. Try to keep your file at the same angle as you make your sharpening strokes. After a couple of strokes, it should be visibly sharper. Turn the blade over and repeat. Large blades like shovels or shears, place them on a sturdy table or preferably a vice for leverage. Your goal is to sharpen and smooth the angle on the edge of the blade called the bevel. Once the blade is sharpened, oil it to help it keep its edge. If the handles are wooden, use wood oil to help preserve them, too. Your tool should now be clean, sharp, and ready to use in the garden. With summer pruning upon us and fall pruning approaching, don’t sabotage your efforts by using dirty pruning tools. While you don’t need to sharpen every time you prune, you should disinfect. Use steps 1 and 2 from above to properly clean and disinfect your tools. Don’t forget to oil after you clean!